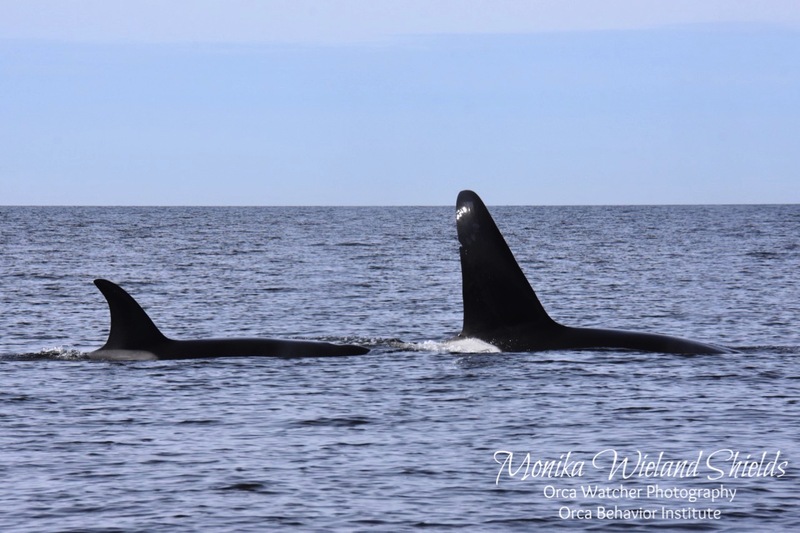 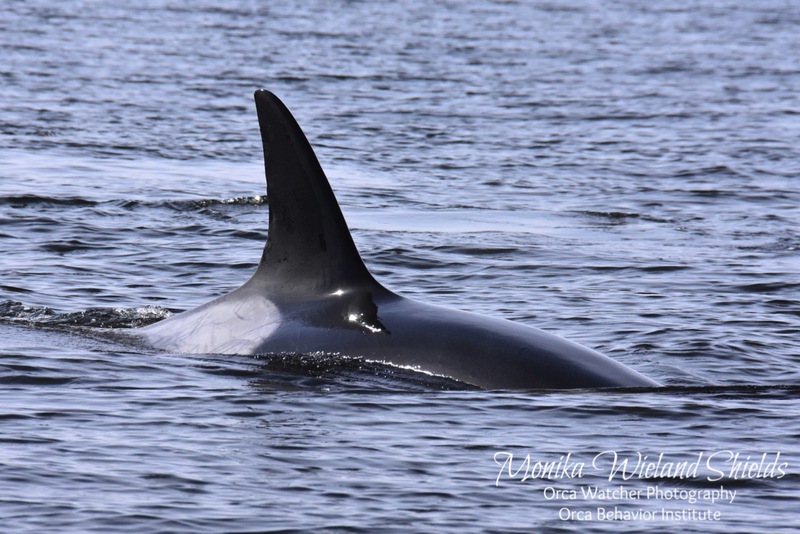 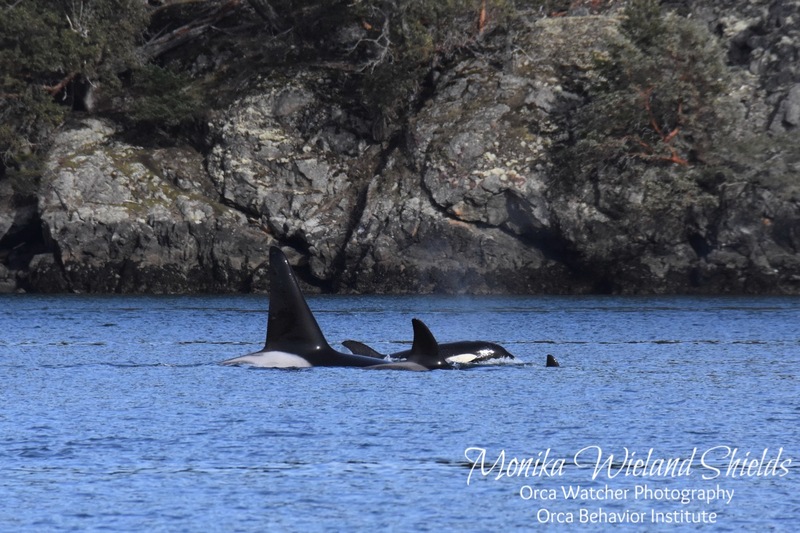 On March 16 we headed out on the water with Maya's Legacy from Friday Harbor. 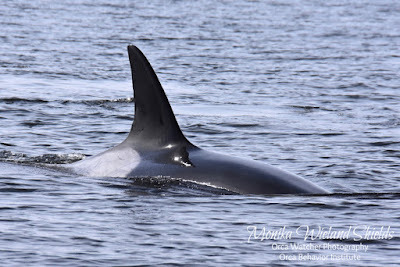 There were no whale reports but it was a beautiful day, and with many groups around over the previous week hopes were high we would find some. 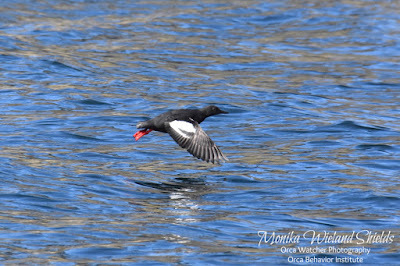 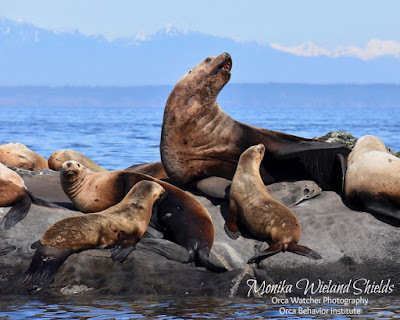 Our first stop though was at Spieden Island, where in addition to the sea lions, there was lots of other activity. 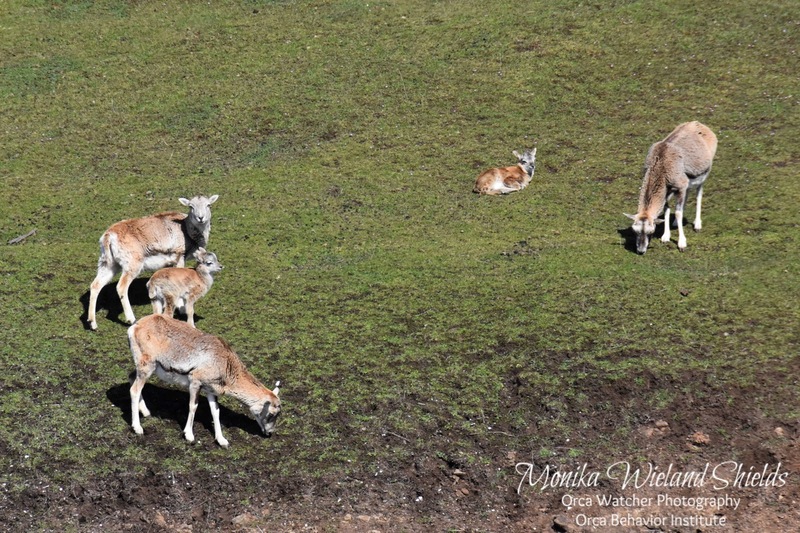 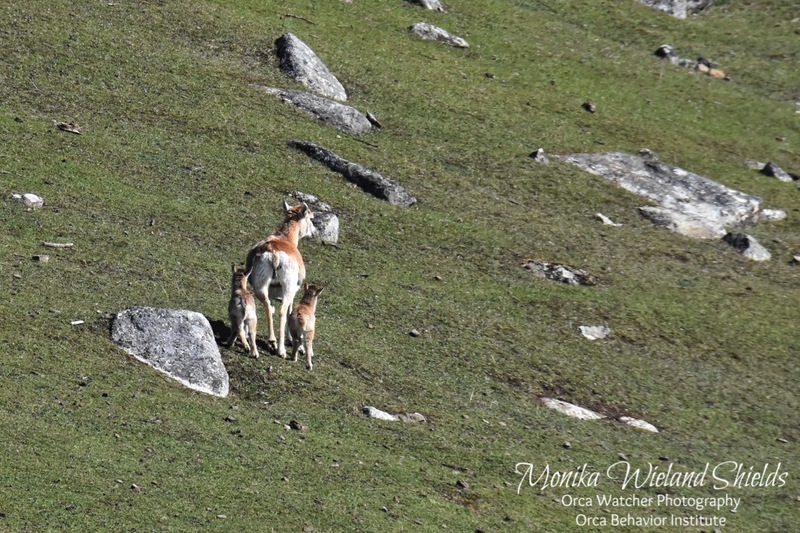 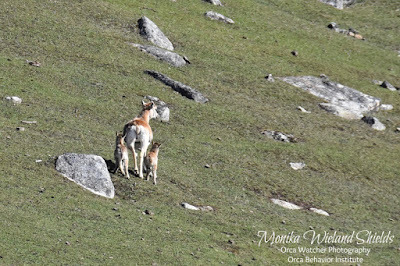 Spring was clearly in the air with lots of Mouflon lambs about. 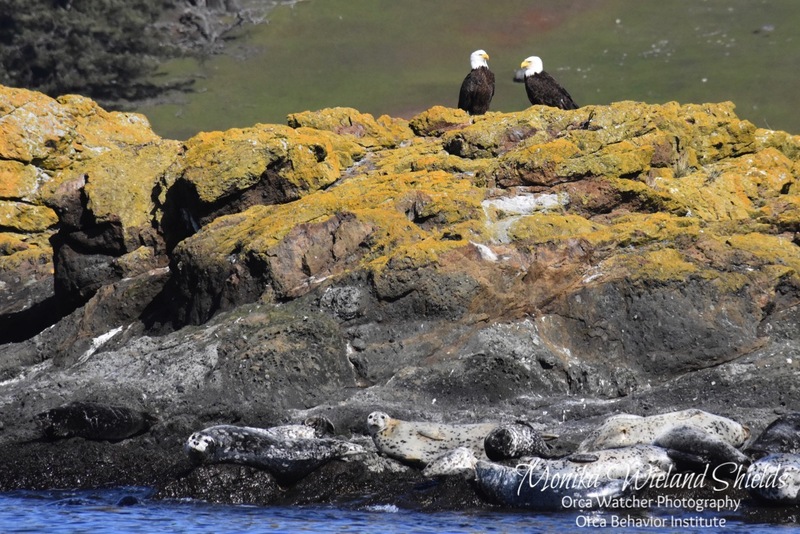 Over at the seal haul out west of Sentinel a pair of bald eagles was hanging out, making for an even cooler photo op! 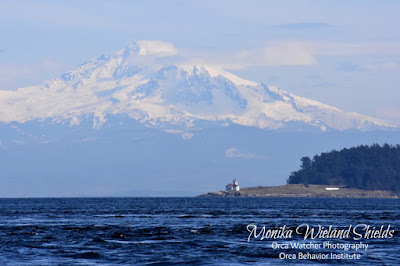 We cruised up around Turn Point and crossed Boundary Pass, with amazing scenery in all directions. 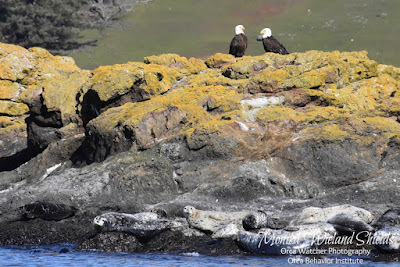 Snaking our way through the Canadian Gulf Islands, we stopped at the Belle Chain Islets - a place I haven't visited in many years! 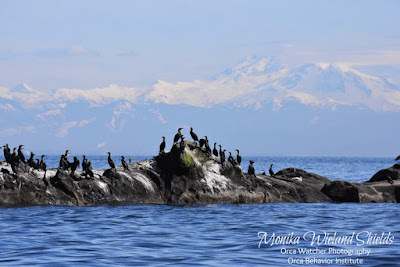 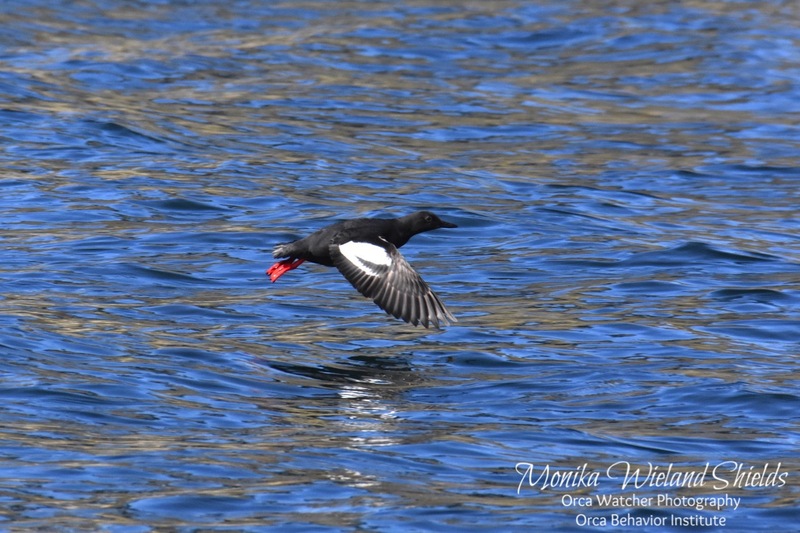 It's one of the most spectacular sea lion haul outs in the region, plus a great spot for bird life, all with snow-capped mountains in the background. 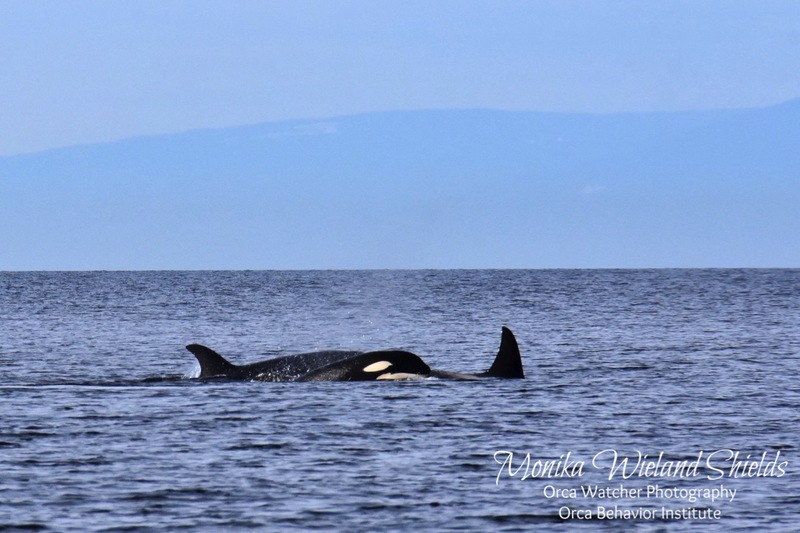 While watching Steller sea lion antics a report came in over the radio that someone had made contact with killer whales, luckily not too far south of us between us and home! We headed in that direction and encountered the T49As and T18s near East Point of Saturna Island. 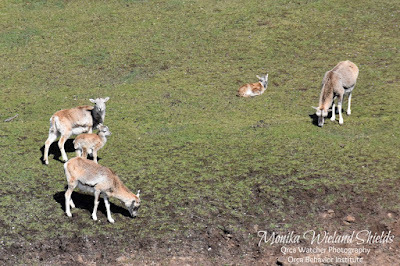 Interestingly they were split into three groups, each with members of both matrilines. 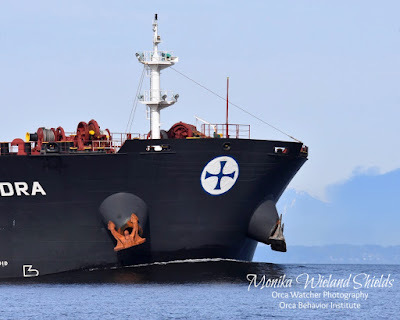 While watching the whales this massive freighter came through - look at how much water its displacing off the bow! 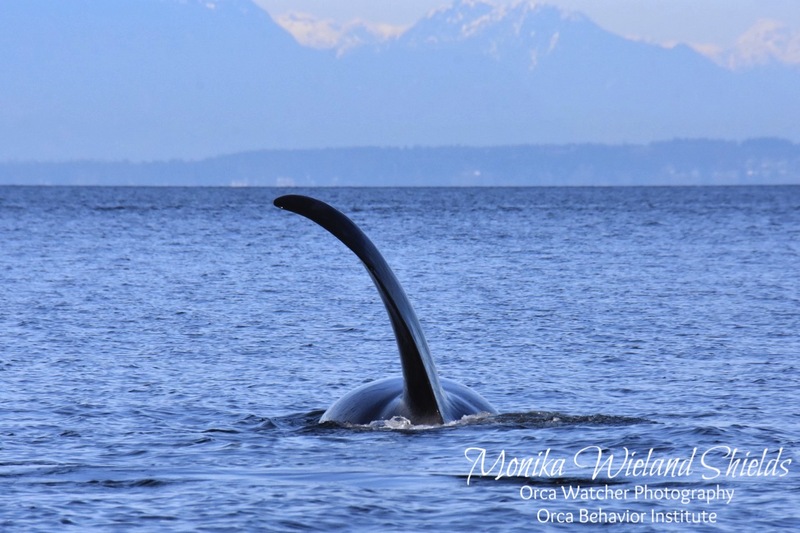 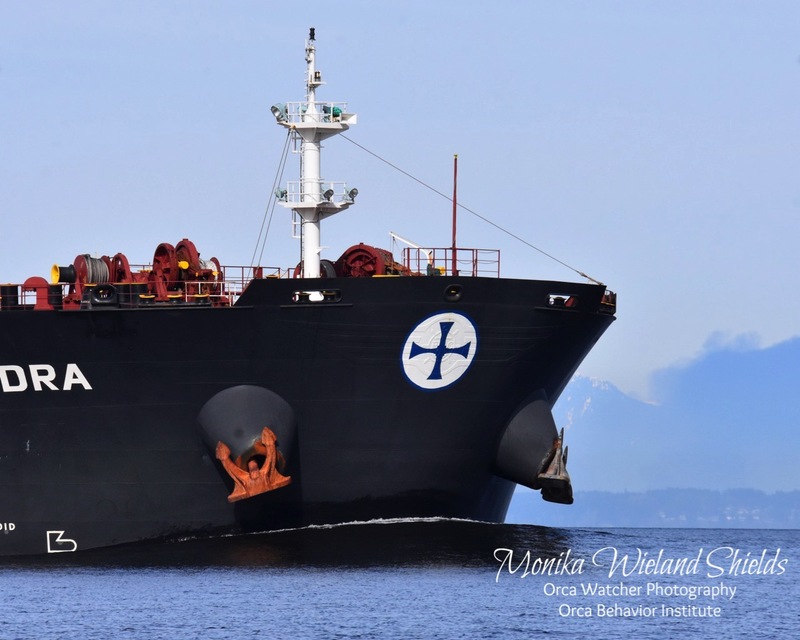 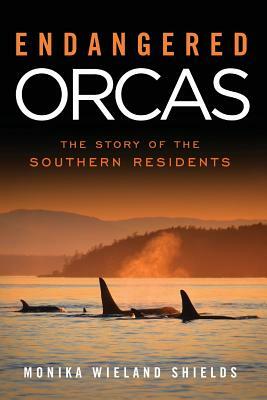 The noise from commercial shipping traffic in the Salish Sea has by far the greatest acoustic impact on the whales. 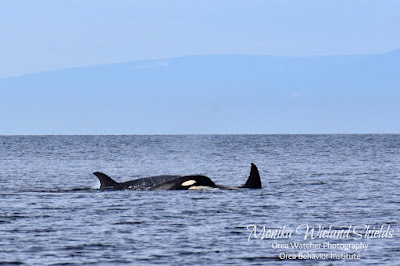 As we departed to make our way back to Friday Harbor, another vessel found an additional group of whales - somewhat amusingly after all our travels, right near Friday Harbor itself. 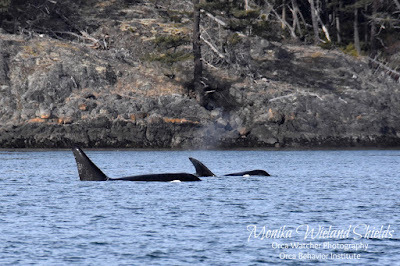 It was too tempting not to make another stop, especially because it was the T2Cs, a very special family group of whales. 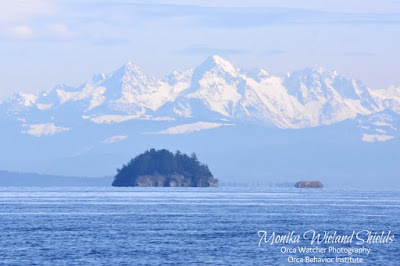 From there it was a very short trip back to the home port, concluding another stunning day on the waters of the Salish Sea! What a great trip! 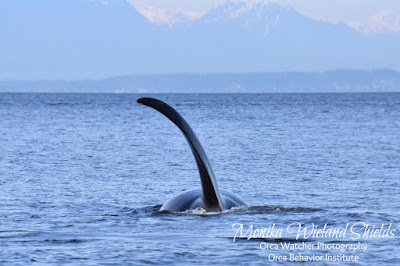 So nice of Maya's Legacy to take you out.